All septic systems consist of two parts: the septic tank and the soil absorption system. Septic tanks with soil absorption systems are the most commonly used wastewater treatment system in rural and suburban areas. 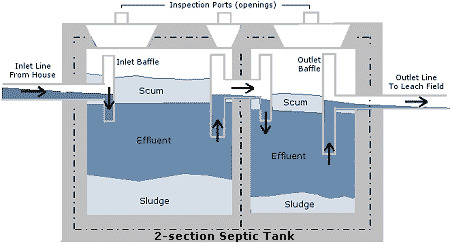 A septic system generally consists of a tank or tanks, between the size of 1,000 and 2,000 gallons, which is/are connected to a wastewater pipe at one end and a septic drain field at the other. How often the septic tank has to be emptied depends on the volume of the tank relative to the input of solids, the amount of indigestible solids and the ambient temperature. Septic tank maintenance is not enough. Proper septic system design for the level of usage and soil conditions is critical if the system is going to have a long useful life. Don't Overload the Septic Tank and Drainfield. Check faucets and toilets for leaks; make repairs if necessary. Use aerators on faucets and flow reducer nozzles on showers to help lower water consumption. Reduce water levels for small loads of laundry. Wait until the dishwasher is full to run it. Use a displacer to reduce the amount of water needed to flush the toilet. Septic tanks serve about 25 million homes in the United States, and countless homes in other nations. Providing Quality Service...Guaranteed In the Greater Austin Area of Travis, Hays, Williamson, Burnet, & Bastrop Counties , San Leanna, Webberville, Point Venture, Buda, WoodCreek, Kyle, Weir, Liberty Hill, Georgetown, Misc Locations, Bell County.